The "data_sample" parameter does not belong to the actual "SPI mode", it is an extra feature of the MCU, see here. 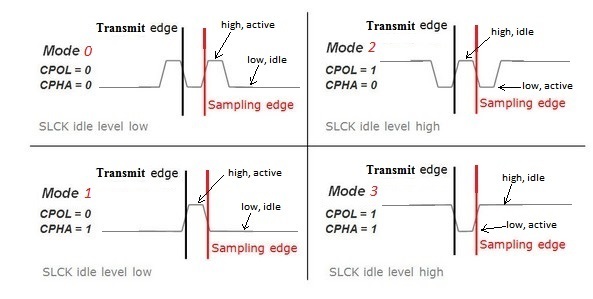 SPI knows 4 "standard" modes, reflecting the SCK's polarity (CPOL) and the SCK's phase (CPHA). the Sampling edge is the clock edge at which the sampling of the SPI input data takes place. The sampling edge is normally the opposite one of the transmit edge, but see also here. The PIC MCU supports a 4 SPI modes, but the MCU registers involved are named differently and behave differently. As you can see, CKP behaves the same as CPOL, CKE is the inverse of CPHA. Above routine can e.g. used after a usage of an mE SPIx_Init... routine to (re)set the SPI mode. In the mE SPI library the "SPI mode" is set by 2 parameters of the "SPIx_Init_Advanced" function. The the parameters for PIC are : "clock_idle" and "transmit_edge"
The the parameters for dsPIC are: "clock_idle" and "edge"
Important: in both cases the last parameter ("transmit edge" or "edge" parameter) is NOT the transmit edge, but the other one, called the "Sampling edge", see here. As you can see the name of the PIC parameter is wrong (it says "transmit_edge"). (**) Again: the "edge" is the "Sampling Edge", not the "Transmit Edge", see here. Deriving the parameters from the device's "SPI mode"
The easiest way is using the "SPI mode" if known, the hardest is deriving the parameters from the device's timing diagram. Important: In mikroPascal the parameter "edge" represents the clock edge where in input data is sampled, not the "transmit edge" (the clock edge at which the SDO data is changed). The parameter "data sample" is not included in the "SPI mode", but usually "_SPI_DATA_SAMPLE_MIDDLE" will do fine, see however also here. This manner has to be applied if the "SPI mode" of the device at hand is not (explicitely) defined. Keep in mind that in the "device" diagram the "device" timing is shown. 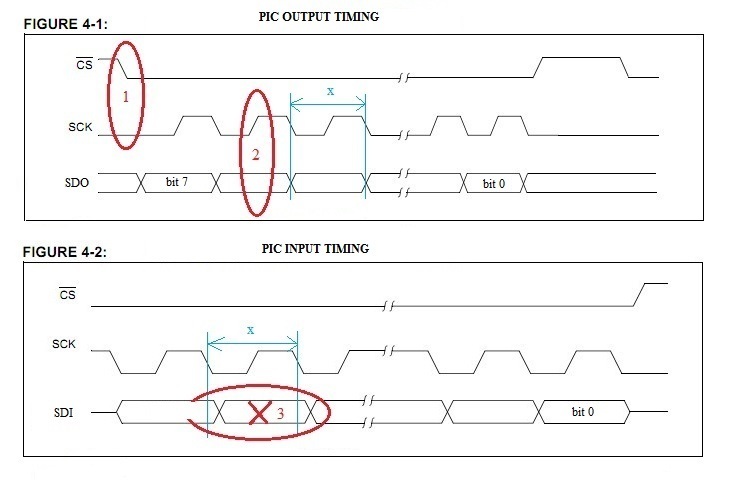 For the PIC timing input and output should be interchanged (which was already done in the above diagram, it shows the timing from the PIC's perspective). See 1 in the diagram. The level wanted is the SCK level at the moment notCS changes. In the diagram this level is zero, so: the clock idle is low. This means also that (again in our case) the clock active level is high. See 2 in the diagram. The edge wanted is the one in the middle between 2 PIC output (PIC SO) datachanges (two "transmit" edges, represented by "x" in the timing diagram). In our case we see that it is the edge from low to high, or from idle to active. 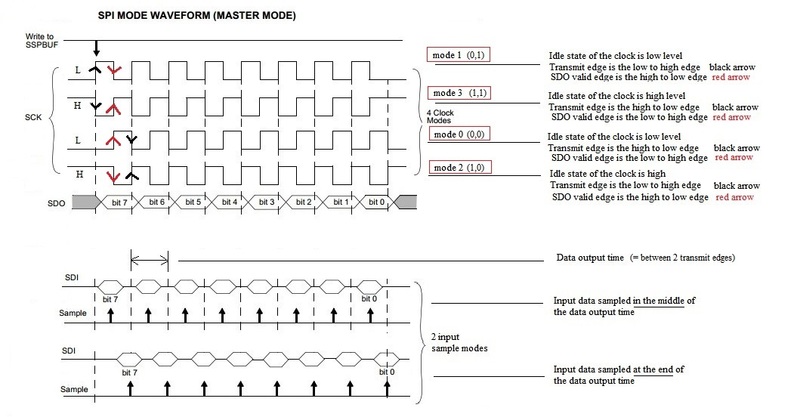 The data_sample parameter is not defined in the SPI mode, it is an extra feature of the MCU. Normally the "Sampling edge" (see here) is the opposite one of the "transmit edge". This is achieved by setting the "data_sample" parameter to the value "_SPI_DATA_SAMPLE_MIDDLE". The sampling moment can however be shifted to the same moment as the transmit edge by setting the "data_sample" parameter to the value "_SPI_DATA_SAMPLE_END" value, see here). See 3 in the above diagram. First define the "data output time", represented by an x in the timing diagram. It is the time from one PIC output data (PIC SO) change to the next. Now compare the device data out (SO = PIC SI) with the "data output time". The data_sample value we have is the best moment in the "data output time" the PIC should take a sample of its input data (the device output data). In our case, the middle of the "data output time" seems to be the most appropriate (at the end would be not bad either).